Dividend Warrior: Jump On The Coat-tails Of Mapletree And Ride Their Wave! Jump On The Coat-tails Of Mapletree And Ride Their Wave! Most of the 'big guns' in the S-REITs universe had reported their results this week. I rank all my 11 vested REITs according to their DPU growth y-o-y below. On the whole, still a healthy performance. 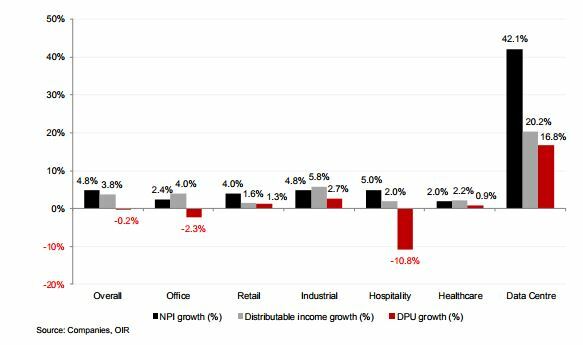 An interesting observation is that all 4 REITs in the Mapletree 'family' have registered DPU growth year-on-year, with MGCCT being the highest and MCT the lowest. Do you think Mapletree is the overall best REIT manager in the Singapore market? Both FCT and ParkwayLife REIT are proven winners with amazing track records of success in growing their annual DPU as well as NAV too. Data centres had registered the greatest growth in December 2017 compared to other property sub-sectors. 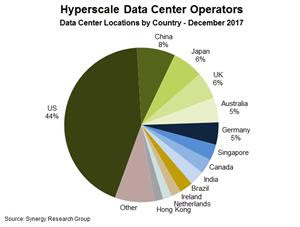 So, I am glad that Mapletree Industrial Trust (MIT) had expanded its mandate to include data centres in the USA, which is the largest data centre market in the world! Last year, MIT has joined with Mapletree Investments to acquire 14 data centres in the US for US$750 million (S$1.02 billion). These data centres sit on freehold land with a portfolio occupancy of 97.4%. The space is leased to 15 tenants from a diverse range of industries such as telecommunications, information technology and financial services, with an average lease to expiry (by gross rental income) of about 6.7 years This acquisition would provide sector as well as geographical diversification. Under the joint venture agreement, MIT will hold a 40% interest while Mapletree Investments will hold 60%. What a good start for the year with almost all reits in yr portfolio registered positive growth in dpu. Also noticed that you finally added MIT. Hope to add more when there is a dip/correction. And yes, i believe they are the best Reit manager,and manager of parkway life reit goes 2nd place! Nice post on reits. I'm also focusing on reits when the rates rise. My opinion is there will be a buying opportunity when 10 yr us treasury yields rise and will give us yummy yields for reits. hi, i wanted to start investing in sreits. are there any advises and recommendations you can give to beginners?